With red peppercorns and sugared snowflake crystals to resemble a festive holly bush, this festive tea looks great and tastes even better! Other flavours indclude clove, dark chocolate, brown sugar and toasted almonds. Brew for 3-5 minutes, and a delicate light green/yellow liquor is present, with a creamy, nutty finish. Ideal for those who wish to indulge this winter. This loose leaf tea really stands out from the crowd as it doesn’t just taste delicious, it also looks fantastic! With red peppercorns and sugared snowflake crystals that resemble a holly bush, it is sure to get you into the Christmas spirit. Clove, dark chocolate, brown sugar and toasted almonds are the other flavours that make up this unique blend. Green tea comes from the same plant as black (Camellia sinensis), but the way they are processed is what makes them different. Black tea is left to ferment which gives the leaves their unique characteristics such as colour and flavour. Green tea does not go through this process which is why it keeps its green colour. It is said to have a mild, earthy taste with more herbal-like qualities. The strength of this flavour depends on how long you brew it for. The leaves grow best in lots of heat, a high humidity and high altitude. If you’ve had a bad experience with green tea, it could be because it is lacking in one of these growing conditions. It does contain some caffeine, although the amount can depend on many factors such as brand, plant, growing conditions, processing etc. It contains less caffeine than an average cup of coffee. This means it is great for those who are particularly sensitive to caffeine and don’t want too much of a buzz. Although it has less caffeine than coffee, it contains an amino acid called L-theanine, which works with caffeine to improve brain function. It has been shown to speed up your metabolic rate which can help you lose weight. It is full of powerful antioxidants which could help protect against some forms of cancer. The catechin content reduces the growth of bacteria and some viruses, lowering the risk of infections and improving dental health. Some experiments have shown mild reductions in blood sugar levels, which may reduce your risk of developing type II diabetes. The bioactive compounds can have various protective effects on neurons, which could reduce chances of Alzheimer’s and Parkinson’s disease. Trying to find something special for everyone on your Christmas list is a challenge most of us face every year. 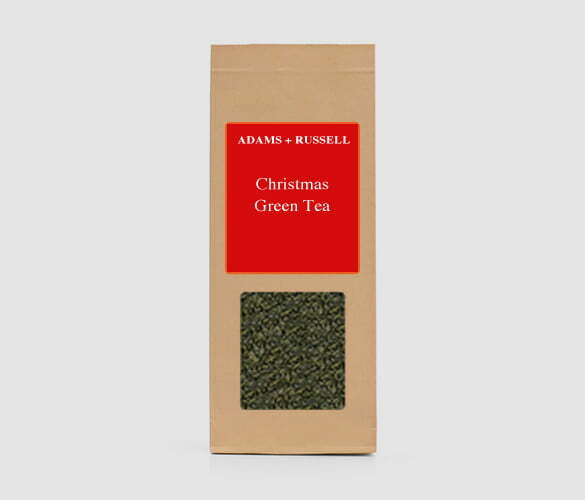 The Adams and Russell Christmas Gift Set is unique and a great way to treat the tea lover in your life. With a luxury glass teapot, silver scoop spoon and 3 bags of fresh loose leaf tea of your choice, you can personalise this gift to suit your preferences. While stocks last and up to 35% off, have a look at our wonderful Gift Set here. If you are struggling with what 3 teas to choose, our ultimate guide to tea is an easy way to find which is best for you.